Altar and tomb of St Francis Xavier, Church of Bom Jesus, Goa. bl.uk > Online Gallery Home	> Online exhibitions	> Asia, Pacific and Africa Collections	> Altar and tomb of St Francis Xavier, Church of Bom Jesus, Goa. 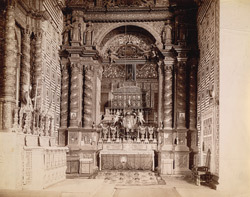 Photograph of the Altar and Tomb of St Francis Xavier in the Church of Bom Jesus, Goa, from the Lee-Warner Collection: 'Bombay Presidency' taken by an unknown photographer in the 1880s. Born in Navarre, Spain, St. Francis Xavier (1506-52), was a former pupil of St. Ignatius Loyola, founder of the Jesuit order; he was ordained in 1537 and came to Goa in 1542. During his time in Goa, St. Francis was credited with nursing the sick, founding numerous churches, converting thirty thousand people as well as performing miracles. Later he went to Sri Lanka, Malaysia, China and Japan to carry on his missionary work. St. Francis died in 1552 at Sancian Island off the coast of China at the age of 46; his body was later moved back to Goa. The tomb, the gift of the Grand Duke Cosmos III of Tuscany was carved by the sculptor Giovanni Batista Foggini; it took ten years to complete and was erected in 1698. Constructed of jasper and marble, the tomb was set out in three tiers: base, mausoleum and casket. The bronze plaques in the middle depict scenes from the life of St. Francis and in front of the casket is a fine silver statue of the saint. The interior of the chapel is richly ornamented with carved detail and paintings illustrating scenes from the saint’s life. Once in a decade, the saint’s remains are displayed to the public on the anniversary of his death, 3rd December.